Raising the minimum wage is promoted as a way to alleviate poverty. However, while a minimum wage hike sounds compassionate, it can backfire on those whom we all want to help. Minimum wage laws make it illegal for employers to offer someone a job for less hourly pay than the government’s mandated minimum. That means that lower-skilled and less-experienced workers will find fewer job opportunities as they are priced out of the employment market. Minimum wage jobs tend to be entry-level jobs, which means that their value is more than just the take-home pay they provide. They are critical skill-building opportunities, allowing workers to gain valuable work experience that will help them start a career and ultimately earn more. In fact, most minimum wage workers receive pay raises so that they are earning more than the minimum after one year. Less than one quarter of minimum wage earners live in households below the poverty line. More than half are between ages 16 and 24, and most are enrolled in school. One would expect this group to be earning less while they gain needed skills and experience. The minimum wage is an inefficient way to try to reduce poverty. Other targeted assistance programs are better vehicles for helping those in need. A higher minimum wage which will only distort the labor market, making job opportunities more scarce and preventing people from beginning their climb up the economic ladder. 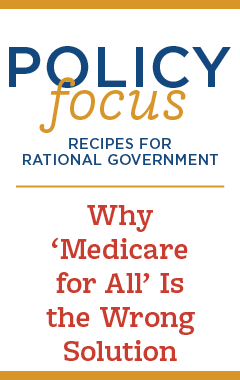 Read the rest of this 6-page policy focus in PDF.